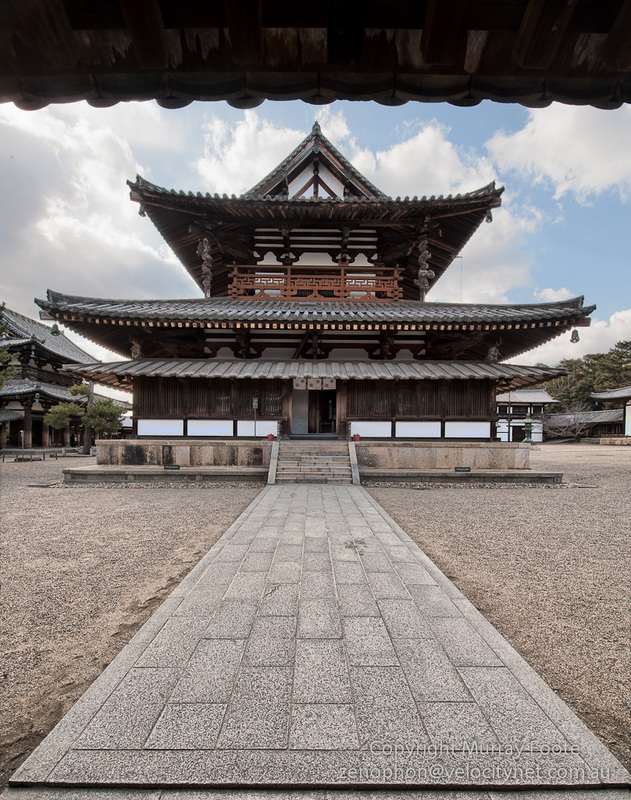 I traveled first by train and then on foot to visit Horyu-ji, south-west of Nara, which contains some of the oldest surviving wooden structures in the world. It is also a very early icon for Japanese Buddhism. 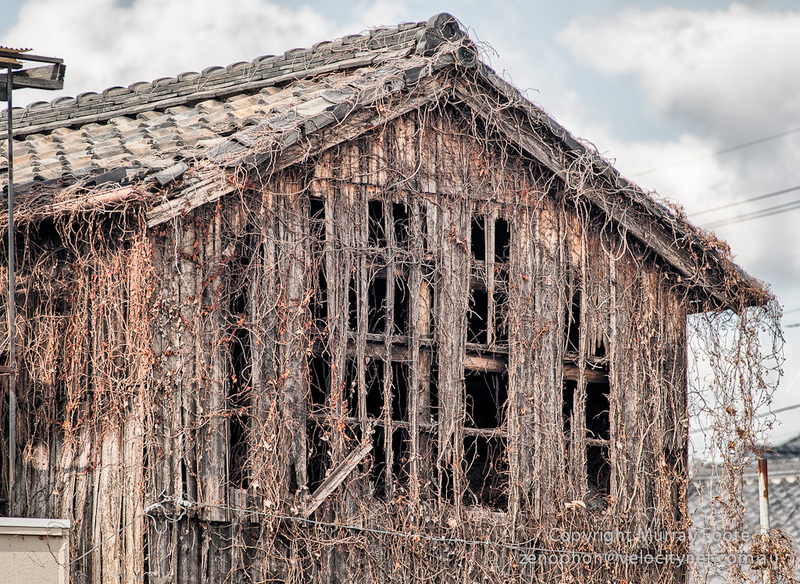 Old building in Nara - post-mod or in need of attention? 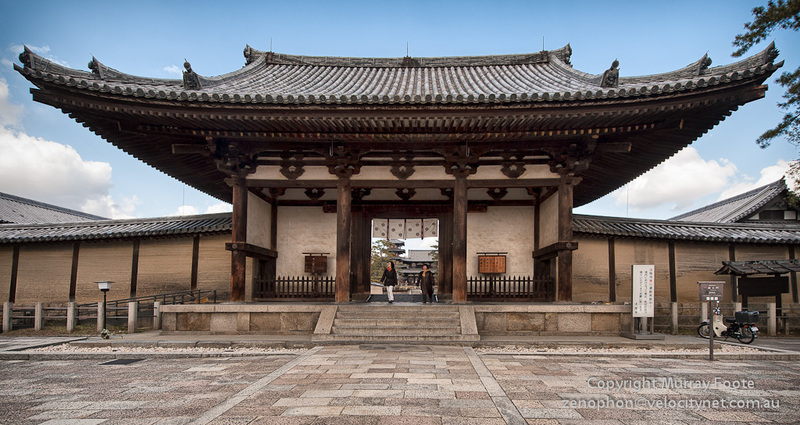 Still in Nara, on my way to the train station to get to Horyu-ji, I wandered past this old building. Perhaps a warehouse, not sure. I’m not an expert in renovations but it occurs to me that this building is possibly in some need of attention. After a train journey and a walk I have reached the main gate of Horyu-ji. This I suspect is a much more recent building than much of Horyu-ji. 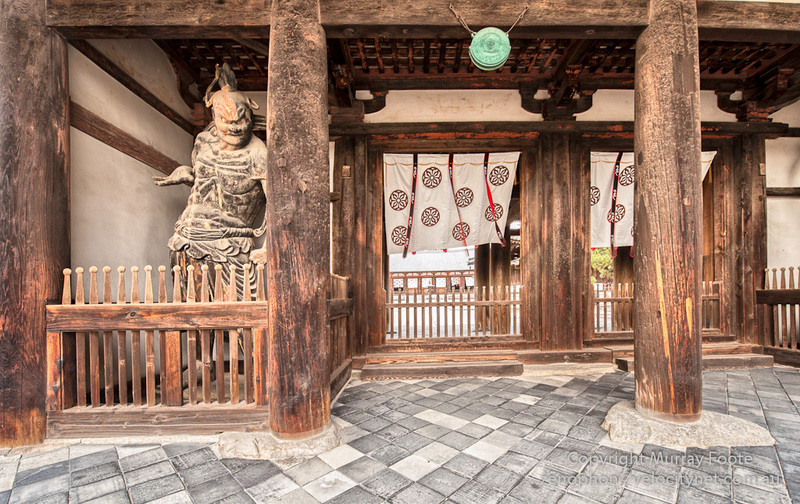 It is just inside the outer gate and is either a small temple or a residence or a combination of the two. 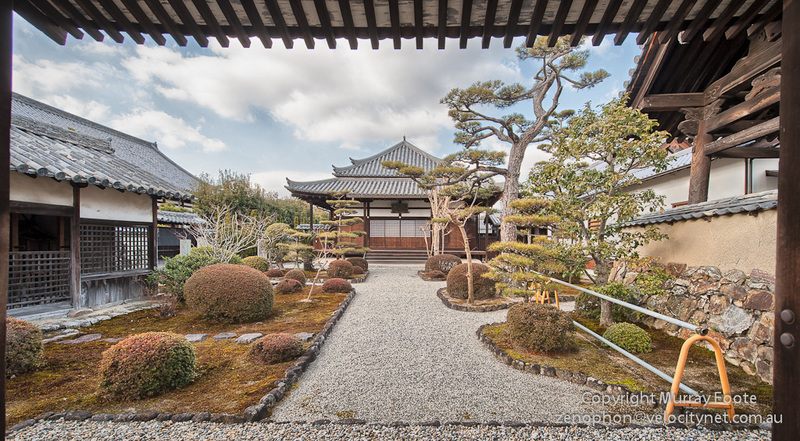 It has a traditional roof with its complex scroll structures and a simple yet elegant garden. Note the paper windows or sliding doors. The paper needs to be replaced I think several times a year. 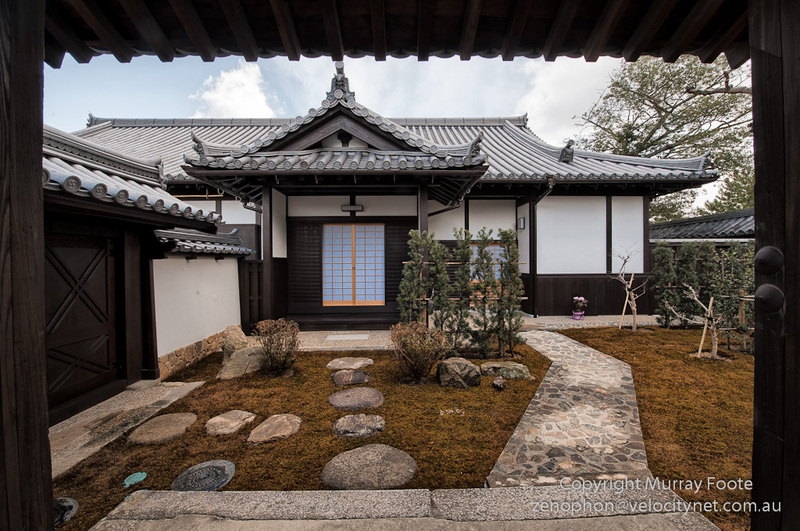 It provides wonderful quality of interior light and ambiance but is rather lacking from an insulation standpoint in winter, as are many Japanese houses in general. Heating in ryokans (traditional Japanese inns) and, I understand, Japanese houses tends to be on an individual room basis and often seems to be turned up curiously high. This is the Chu-mon or middle gate, showing one of its guardians, and dating back as early as 607AD. In the West at this time, the Western Roman Empire was overrun 130 years before and Justinian had been dead for 40 years. Europe was in the middle of a period (550-650) where the bubonic plague would kill up to a third of the population. The Byzantine Empire was between dynasties and sorely pressed by the Persians. Heraclius became emperor a few years later and obliterated the Persians but exhausted Byzantium. Then from a dozen or so years later, the Moslems rose and took over Persia, Egypt and North Africa. In the Americas, for that matter, the Zapotec, Maya, Moche and Pueblo peoples were thriving in their respective civilisations while Teotihuacan was already gone and both the Aztecs and Incas were many centuries away. China was in a period of order and renewal and the short-lived Sui Empire was giving way to the Tang. This probably had much do to with the extent of Japanese cultural imports from China at this time. Past the Chu-mon gate we have the Kairo or Cloister-Gallery, which forms an expansive wall around the Kondo (or Main Hall), the Goju-no-To (five-story pagoda) and the Daikodo (or Great Lecture Hall). We will see these below. 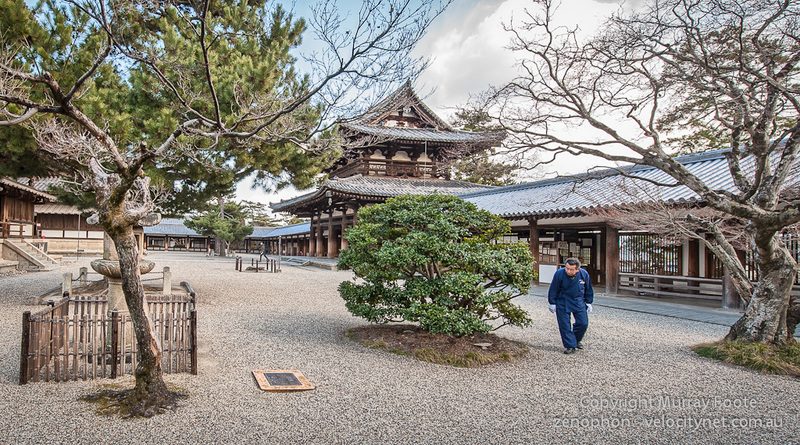 This is the Kondo, originally built in the 7th century. 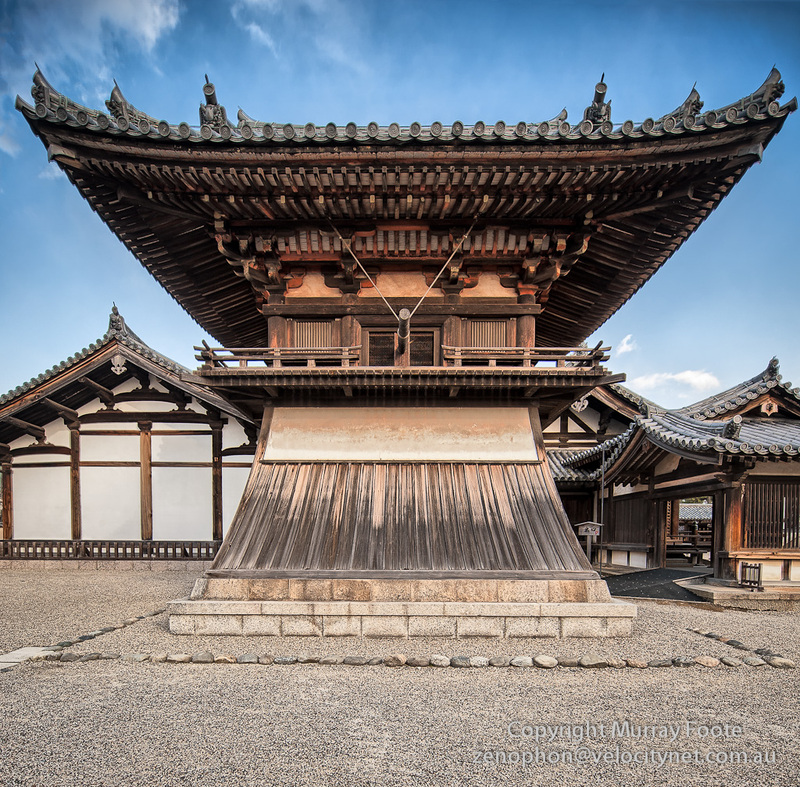 It is claimed as perhaps the oldest wooden building in the world, though only 15% to 20% are original materials. There are impressive statues and murals inside, but no photography is allowed there. The Daikodo or Great Lecture Hall, burnt down in 990 and was rebuilt at that time. And here is the Goju-no-To, dating back to 607, the oldest such pagoda in Japan. The Kondo is in the background. 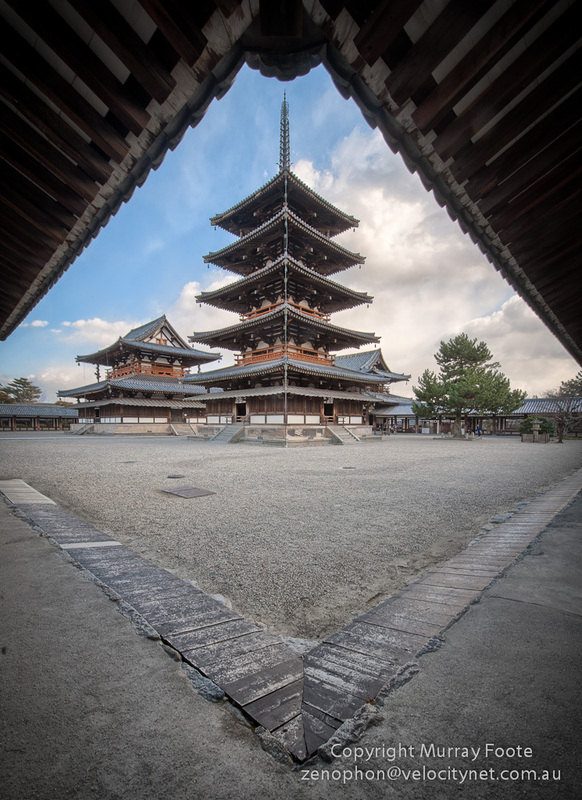 During the Second World War, this pagoda was disassembled, stored elsewhere, then reassembled using the original materials. The images above are from the main group of buildings in the Western Precinct, apart from the last two. This is the Toin Shoro or Bell Tower from the Eastern Precinct. You can see there is something resembling a log, hanging supported by a rope and a hole in a large wooden plank. That is the striker for the bell. Originally built around 600, this temple was at first a monastery and much later, a nunnery. The last reconstruction completed in 1968. 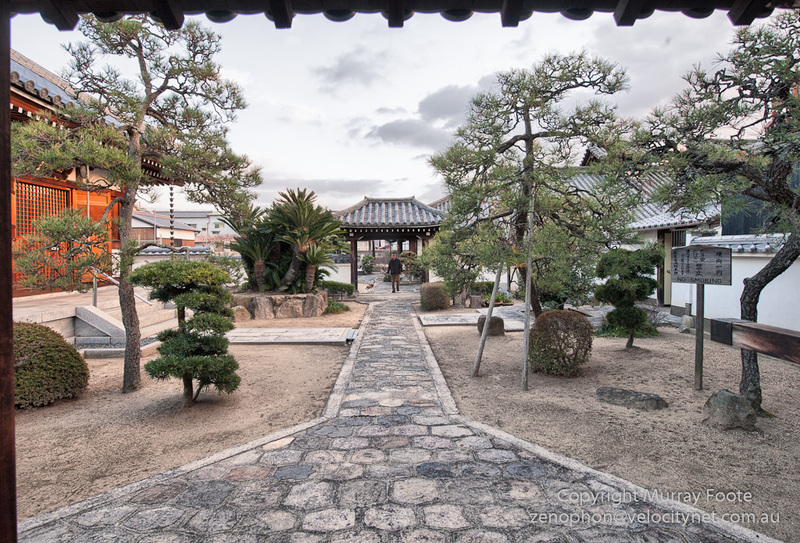 Back in Nara, nearly back to the ryokan, I photographed the courtyard of a small Buddhist temple. You may observe under the far gate, a man (probably a Buddhist Priest) taking his dog for a walk, who just appeared as I was taking the picture. 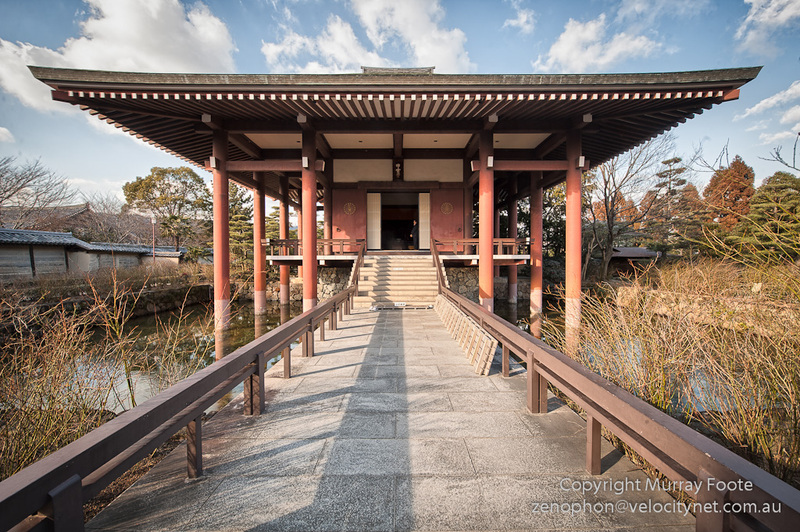 Religions is important in Japanese history, not just as an esoteric pursuit, but because the different forms of religion, even the very different forms of Buddhism, have been closely intertwined with the development of the Japanese state. Up until about 600, the Japanese religion was Shinto, essentially a kind of animism involving the worship of spirits. Buddhism then became increasingly important, imported from China either directly or through Korea, yet Shinto continued to co-exist with it. The Yamato dynasty originally claimed a special role under Shinto due to a unique and exclusive relationship with Ameratsu, the Sub-Goddess. With the rise of Buddhism, they claimed a similar role in that religion. The Emperor Shugo, a fervent Buddhist, tried to engender a State-centred Buddhism but the priests became too powerful after some decades, causing the later Emperor Kammu to move the capital to Hiean-kyo (Kyoto). Kammu commissioned the monk Saicho to go to China in 804 and bring back a new teaching that would eclipse the troublesome monks from Nara. This became the Tendai school which set out clear structures while tolerating existing beliefs. Another monk, Kukai, who also went to China, took this further and established a pyramid of faiths with his sect at the top. This became the Shingon school. In either case, to be an avid practitioner required extensive time to follow elaborate rituals, literacy to read scriptures and financial ease to make these conditions possible. Thus it was a religion for the aristocracy and bolstered the position of the aristocracy in Classical Japan. Several hundred years later, two monks Esai (1141-1215) and Dogen (1200-1253) established Zen as a major movement in Japan. Both had studied for some years in China and they founded Rinzai Zen and Soto Zen respectively. Zen was very different from Classical Buddhism. Instead of ritual, good works and reading sacred texts, the emphasis was on dialogue with a master, self-discipline and meditation. Also, Classical Buddhism incorporated much of the pantheon of Hinduism and other local religions on its way from India through China. Zen is relatively free of this. The coming of Zen coincided with the Kamakura period (1185-1333). This was the triumph of regional warlords or bushi over the aristocracy and the Emperor. A simpler religion was more in keeping with the times and more generally accessible. With the return of power to Kyoto in the Ashikaga period, Rinzai Zen became favoured by those in power and Samurai generally. Soto Zen was specified more to the common people and avoided political associations. One of the main activities of Soto Zen today is the conducting of funerals. The other main forms of Buddhism in the medieval period were Amidism and the Lotus sect. Both of these were faith-based, in contrast to Zen with its emphasis on self-discipline. Amida was an ancient or legendary monk said to have become a Buddha with a focus on benefiting all Mankind. Honen (1133-1212) and Shinran (1173-1262) were the main proponents. The Lotus Sect focused on the Lotus Sutra and its founder was Nichiren (1222-1282). It was rather intolerant of other Buddhist schools. Particularly in the Warring States period, temples could have small armies and could attack each other, particularly as between Amidism and the Lotus Sect. Also, the defeat of the monk-armies of the Singon sect on Mt Hiei near Kyoto was a significant milestone in Oda Nobunaga taking control of much of the country at the end of that period. After 1868, there were edicts to separate Shinto and Buddhism and Shinto became the official State religion (as a native Japanese religion). For a while, some forms of Buddhism were suppressed and some temples destroyed. This was partly due to the association of Tokugawa rule with some forms of Buddhism and partly because after the suppression of Christianity, it became compulsory for all Japanese to belong to a Buddhist temple. Contemporary Japanese are notably free of religious affiliations. Though most will subscribe to particular rituals of different religions at appropriate times, a 2000 survey by Yomiuri Shimbun showed that 77% of Japanese do not believe in a specific religion. (Yomiuri Shimbun is a Japanese newspaper reputed to have the largest circulation of any newspaper in theworld). 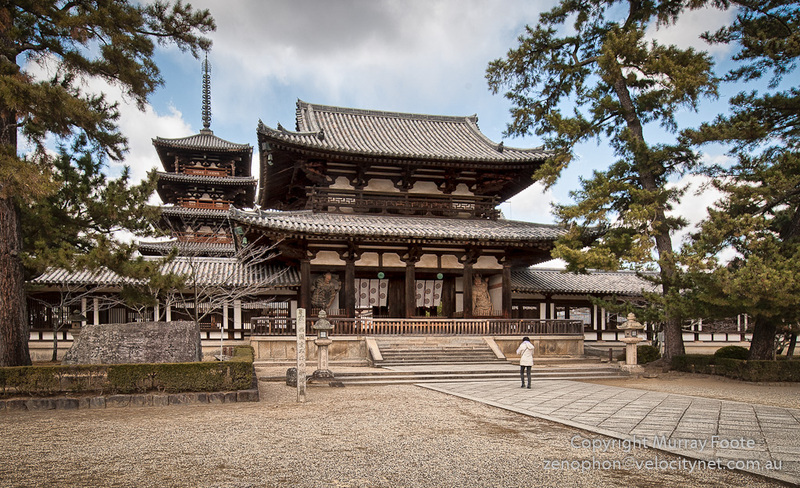 This entry was posted in Japan, Nara and tagged Horyu-ji, Japan, Nara, Photography, Travel.